It's had been a few years since our last meeting, since Elias was still a baby, but good friends are always there when you call on them. Kevin and family welcomed us in from our journey and harbored us in an old camping trailer in their backyard for a couple nights. It was great with a couple days of home cooked food and catching up on old times with some of the local handcrafted brew. In the beautiful autumn weather we loaded into Kevin's old Pontiac for a leisurely drive out to the cabin before spending the afternoon exploring the boulders of the Butte Batholith. Since my school days back in the early 90's I'd heard Kevin tell me about the untouched bounty that lie hidden in the hills back home in Montana. Finally after all these years I finally made it out to experience it for myself. But our day in the hills wasn't about old friends pulling down hard boulder problems, it was about hanging out with our families enjoying a serene place and do a little bouldering. I think for both of us, there was more fun watching our kids find their own boulder problems as it was for us to try our own. Elias got to borrow (and then keep) a pair of real climbing shoes for the first time. The extra psychological edge along with sticky rubber sent him running off in search of new problems to solve. Ladd, Kevin's youngest, got to take the day off from school to come along and show Elias his impressive climbing talent. Frêney tagged along looking for boulders his size to scramble over. 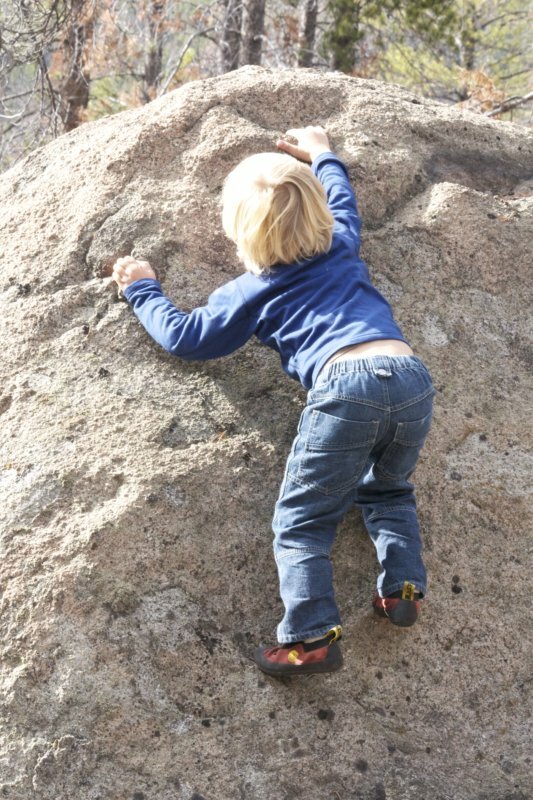 It's always a pleasure to watch how children react in the great outdoors, not only with climbing, but exploring. They are always content and have more than enough to keep them occupied. Of course, as climbing dads we also appreciate being able to both hang out in the outdoors ourselves and share our own enjoyment with our kids. The rumors of the batholith proved to be true, and the Montanan hospitality left us with high spirits as we continued on towards more adventures further south.